It’s travel day, and I’m feeling exhausted before I begin. We’ve eaten out on approximately 56 of the 60 days on the road and I need a shower, but for some reason using wipes on a daily basis instead has become acceptable, even though we have a beautiful shower in our bus. The worst thing of all is that, on most days, I can’t poop. It’s as if my body thinks I am on one big stressful business trip! Today will be our seventh move since we’ve been on the bus, and our 100th (I’m exaggerating) manual toilet clean. For an adventure of a life time, I sure am perturbed. My whole life has been about controlling my surroundings, protecting myself from adversity. As I sit on the bus sofa with a space heater at my feat, I beg myself to remember why our family actually is doing this. My friend Heather sent me an article last night about skoolie living—for all intents and purposes, that’s us for the year. The article speaks about why the skoolie people have chosen this particular lifestyle and describes how much money a family of four—six—can survive on in comparison to the average family that lives a more “settled” life, meaning in a house that doesn’t move. That’s not us! Let me tell you again, that’s not us! Putting it another way, our mechanic bills alone in the past two weeks would be enough for a skoolie family (as described in the article) to live on for 3 months straight, and for us, just one night in an RV park is double to triple the national park discount card they get and use for an entire year. 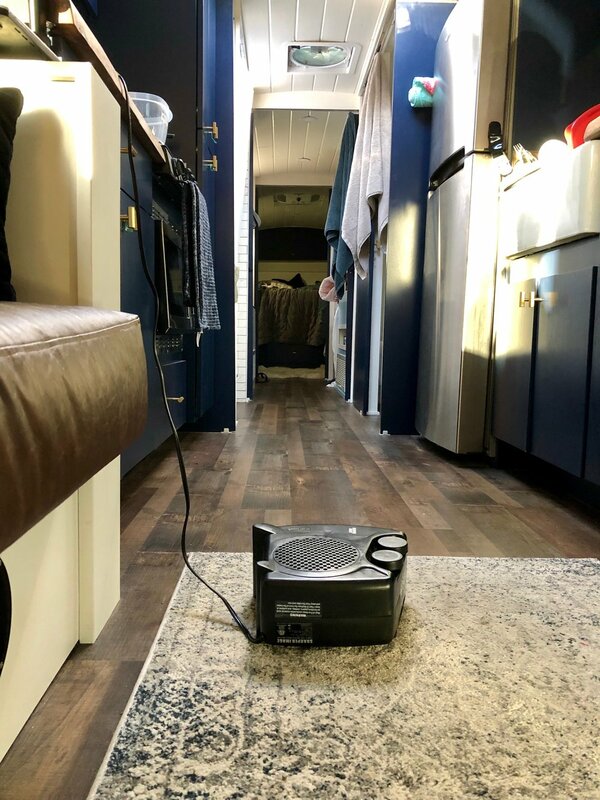 Look, although we opted for solar panels and lithium batteries when we built our bus, it doesn’t mean that I actually have any intention of boondocking—parking in a Walmart or Home Depot parking lot, or anywhere else that doesn’t provide electrical or water hook up. Just because I’m refusing to shower currently doesn’t mean I don’t want it available to me whenever I decide its officially time—or my husband does. My whole life is about letting go right now and I only want to let go of anything that’s not moving. I need a routine, because the only guarantee on the road is that life is unpredictable, really unpredictable! So why did I decide to live on a converted school bus for a year, and travel around the US with our family, homeschool, and speak about mental health and addiction? To tell the truth, I do know why and the desire is still strong. I want desperately to help break the stigma surrounding mental health and addiction so that more lives can be saved. I want to do it with my family. I want to experience more of life than I can control, because that is life. I don’t want my fear to dictate my life, and steer me only toward the things I can control. This year was always about two things: what we help change outside the bus, and what change we could bring to ourselves inside the bus. However, some days, I forget why I am doing this and panic. Our house in Denver, Colorado has been sold. The new owners have moved in already, so there’s nowhere to go but the bus right now and anxiety is my only real constant. Maybe knowing this right now—the constant of anxiety—is what I can hold on to—without judgment.